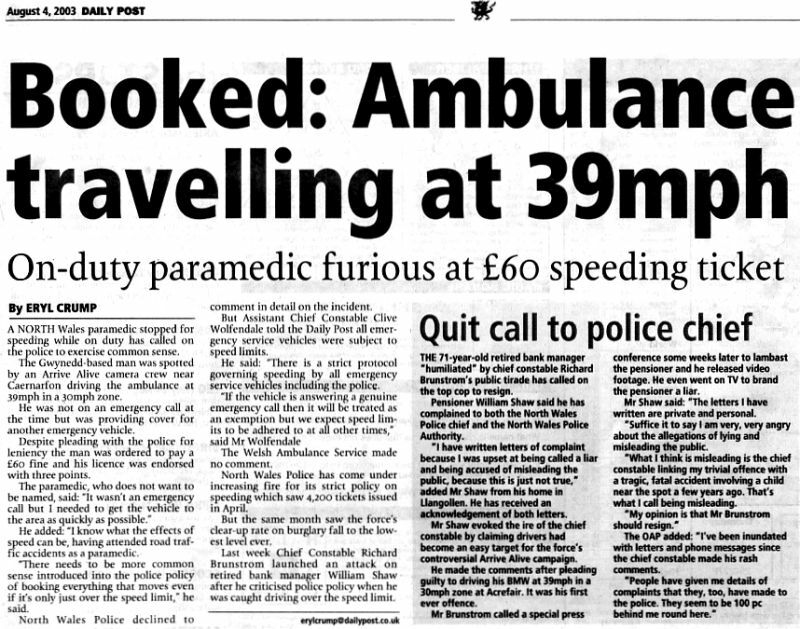 The Speed Camera Partnership in North Wales call themselves "Arrive Alive". It's time to resign Mr Brunstrom. William Shaw. Image from BBC web site. 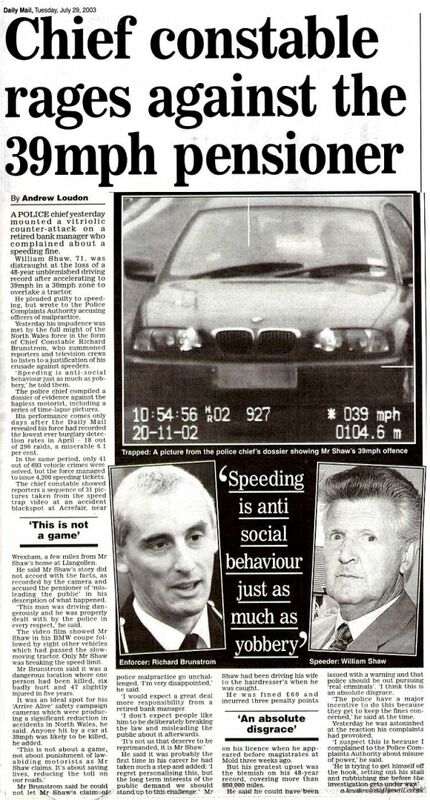 William Shaw, a 71 year old retired bank manager, was recently "convicted" for 39 mph while overtaking a tractor. Read the BBC story (here). Needless to say there's a bit of a row brewing, and the local MP (Martyn Jones) has become involved. The article below appeared in the local paper: The Daily Post on 9th July 2003. In support of the MP's complaints, we decided to write to "Arrive Alive" and question the precise basis of their casualty reduction figures (below). new 29th July 2003: In an astonishingly heavy handed and unnecessary move, the Police called a press conference to attack Mr Shaw. Read the BBC story here: (click here) There's reek of complete desperation about Arrive Alive's recent activity. See below for the Daily Mail article about this astonishing incident. Perhaps we'll soon be able to write about a meltdown in North Wales. 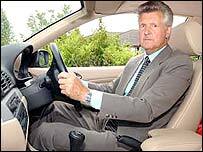 new 4th August 2003: Arrive Alive continue to work very hard to lose every last scrap of public support. This time they have attacked an on duty ambulance driver - in his ambulance. See below. I find the claims astonishing, and I wonder how carefully you have prepared your figures. I expect a brief but clear and accurate answer to each numbered point. 4) What has been the effect of other safety treatments applied along Arrive Alive routes that may have been installed at a similar time to the camera? 6) Have you measured and compensated for any change in traffic volumes along the Arrive Alive routes? 9) I note that you appear to be comparing a 1998 to 2000 inclusive average with 2002. What is your justification for choosing this comparison? What is wrong with 2001? Does making these rather strange choices of periods exaggerate the claimed “benefit”? 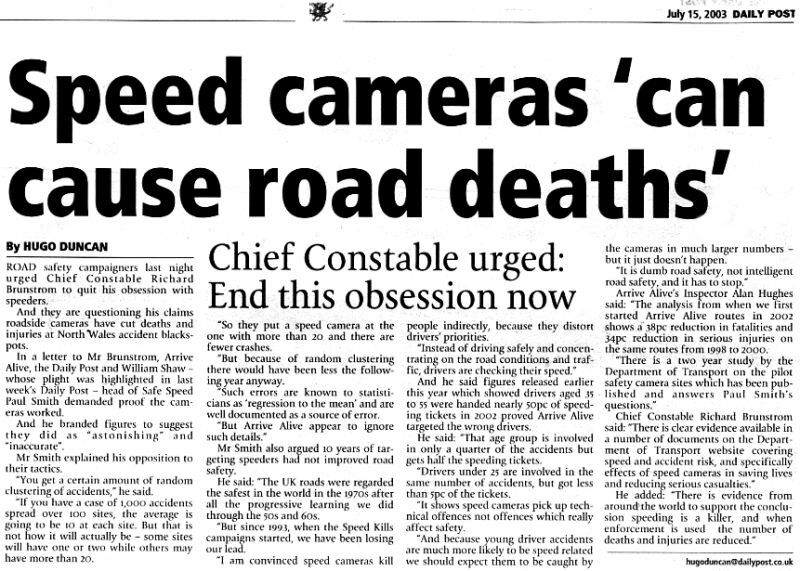 10) If you look at whole county figures going back at least fifteen years and spanning the introduction of speed cameras, do you see any change in trends over the period of camera introduction? Please be sure to examine separately figures for casualties, serious injuries and fatalities. Which three-year period shows the greatest overall improvement? Was that before or after the cameras? I look forward to your considered reply, which I intend to publish to the Safe Speed web site. William Shaw and many hundreds of thousands of other safe drivers each year should not be convicted by dumb speed enforcement. The so-called "safety camera partnerships" appear to understand very little about road safety and are just pointlessly upsetting decent members of the public. This must stop. It will be interesting to see them try to justify their extraordinary claims for casualty reduction. We will certainly publish any reply here on this page. We have noted errors in the claims made by speed camera partnerships before and report on the methods (here). Should you wish to question the casualty reduction claims made by a Speed Camera Partnership you will find an outline letter (here).